Piero Fornasetti was born in 1913 in Milan. He studied at Brera Art Academy from 1930 to 1932, when he was expelled for insubordination.During World War II, Fornasetti went into exile in Switzerland from 1943 to 1946. He joined the artists of the "Gruppo Novecento". In 1940 Piero presented his works at the Triennale of Milan and he designed a seires of objects for S.A.L.I.R. 's, engraved by Franz Pelzel. Fornasetti created more than 11,000 items, many featuring the face of a woman, operatic soprano Lina Cavalieri, as a motif. Other common features in his work include heavy use of black and white, the sun and time. His style is reminiscent of Greek and Roman architecture, by which he was heavily influenced. He died in Milan 1988. 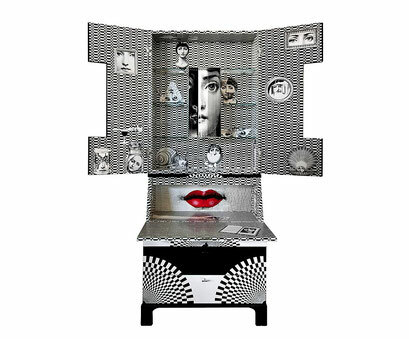 His son, Barnaba Fornasetti, continues to design in his father's name.